Game day is a different beast. We need to know the foam we’ve selected will do the job and mitigate the hazard at hand. Seeing a void in the industry, Dwight Williams has recently been working with US Fire Pump to develop new products and training methods for industrial firefighter providing better performance on large fire scenes that reduce risk, minimize exposure and save life and property. Dwight has been working diligently to develop a Signature Series Foam Concentrate that will outperform any on the market today. With over 100 major successful operations of extinguishment and control of hazardous situations, Dwight Williams has established himself as an industry expert and pioneer. He lead his team through the development of specialized equipment and methodology so unique, they were patented during his ownership of his previous company. Dwight re-defined extinguishment by making it faster and safer with less exposure to the firefighter. 3M & Dwight Williams started the Foam Technology Workshop around 1984, now known as the Extreme School. Dwight Williams has been involved and/or responsible for 25+ patents. The WF&HC Job List in 2011, exceeding 100 Emergency Service Jobs, included the two largest tank fires acknowledged in the world and were led by Dwight Williams, one of which is still to date the largest extinguished “Orion”. These two fires were extinguished using 3M ATC Foam. Since Dwight William’s departure from Tyco in 2011, he feels there has not been a lot of new, innovative ideas introduced into this industry. He feels it is important to continue his legacy and bring new technology into the industrial firefighting world. As a result, Signature Series Foam was developed. Inducted into the Hall of Legacies, Legends and Leaders in 2018 (only one in the industrial industry to receive) Dwight has received numerous other awards in his successful career in this industry. 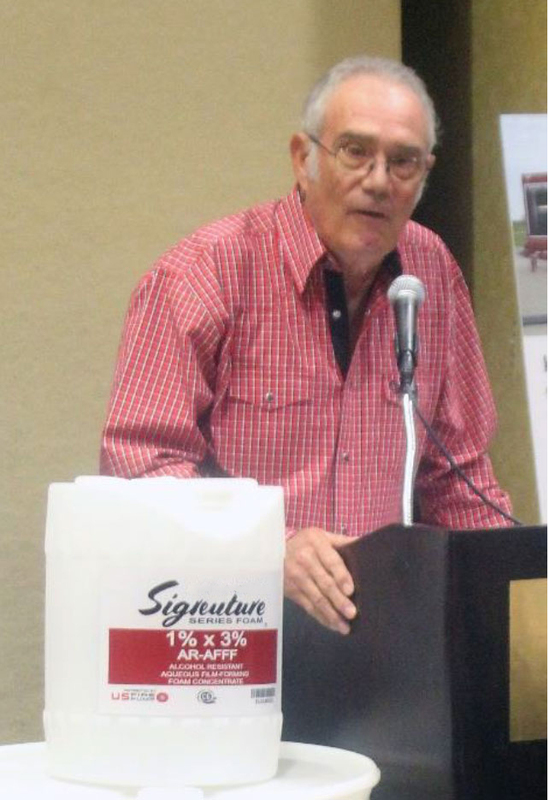 Dwight Williams speaking at the recent US Fire Pump "Big Water Symposium".